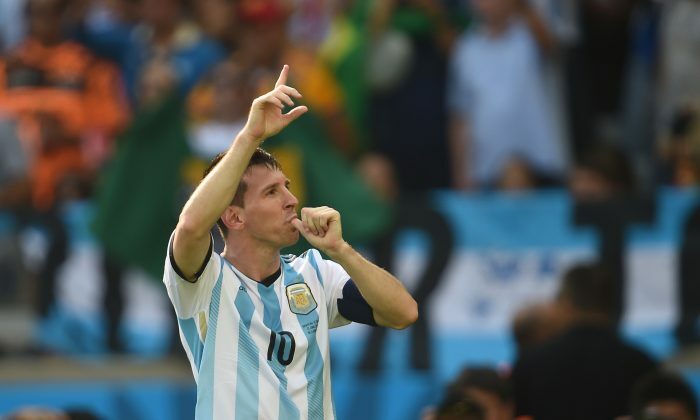 Argentina will take on Nigeria in a World Cup 2014 Group F match on Wednesday, June 25. Kick-off time is 12:00 p.m. EDT at Estádio Beira-Rio, Porto Alegre. The game will be broadcast on Canal 7 TV Publica, TyC Sports Argentina, and DIRECTV Argentina in Argentina, as well as SLGO and SuperSport Select in Nigeria. The game will also air on BBC Radio 5 Live, STV Scotland, ITV 1 UK, UTV, and TalkSport Radio in the United Kingdom, as well as Univision USA, SiriusXM FC, Univision Deportes USA, Univision Deportes En Vivo, ESPN Radio, and ESPN in the United States. PORTO ALEGRE, Brazil (AP) — The Lionel Messi show is coming to this southern Brazilian city, along with hordes of the Argentina striker’s loyal fans. Porto Alegre is close to the Argentine border, and thousands have already made the crossing into Brazil, many sleeping in buses and vans ahead of Wednesday’s game against Nigeria. Local media reports that more than 50,000 are expected, though less than half will have tickets to an event that could be a test for security authorities. As predicted in the run-up to the tournament, Messi has been the key to success for Argentina, which has already qualified for the second round. Currently top of Group F after two scrappy wins, it will stay there if it gets at least a point against Nigeria. A draw would also suit the Nigerians, who would seal second place in the group and their first appearance in the knockout stages since 1998. They could also lose and still progress if Iran fails to beat Bosnia-Herzegovina in a match being played at the same time. The Argentina lineup is aiming to produce a better team performance in front of its fans, who have had little to cheer about so far — apart from Messi. The 26-year-old Barcelona star scored a second-half goal against Bosnia-Herzegovina in an opening 2-1 victory, and popped up in added time to curl in a left-foot shot from outside the penalty area for the only goal of the game against Iran. Nigeria arrived in Brazil as the reigning African champions but underwhelmed at last year’s Confederation Cup, where it lost to Uruguay and Spain after an easy win over Tahiti. The team wasn’t tested much in qualification for the World Cup. With the likes of Chelsea’s John Obi Mikel and Liverpool’s Victor Moses in the squad, Nigeria is where most people expected it to be in Group F, in second place behind Argentina. After a 0-0 draw with Iran 0-0, Nigeria played better in a 1-0 victory over Bosnia-Herzegovina, courtesy of a first-half goal by Stoke City striker Peter Odemwingie. The group remains tight, and one set of results on Wednesday would see second place decided by the drawing of lots by the FIFA organizing committee. If Nigeria loses 1-0 and Iran wins 1-0, both teams would have the same goal difference and number of goals scored, and could not be separated by their head-to-head result. State public safety secretary Airton Michels has said that an additional 1,500 security officers will be drafted into Porto Alegre, a city of wide European-style avenues and leafy parks on the banks of a massive inland lake. Federal police have attempted to stop Argentinian fans with criminal records from crossing the border, but it is unclear how successful this has been. The World Cup has so far been largely peaceful, but drunken Argentinian and Brazilian fans clashed briefly on a street in Belo Horizonte on Saturday. Inside the stadium police arrested two suspected members of Argentina’s infamous hooligan gangs — known in Spanish as “Barras Bravas.” They were ordered to leave the country within 72 hours.